Select the checkbox next to the items you want associated with a milestone. In the upper-right corner, click Milestone, then start typing the name of an existing milestone. Click the milestone's name to associate it with the item. As you're working on issues and pull requests, you can track the progress of your milestone. 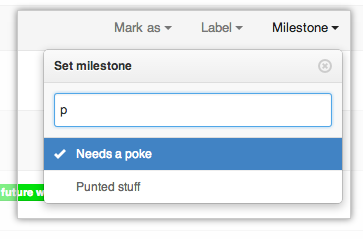 "Creating and editing milestones for issues and pull requests"